One of the great things about Highgroove is our commitment to balancing work and free time. However, when I decided to embark on a month-long European adventure, I was determined to give the international working vacation a shot. I thought that I had prepared myself for the challenge of working abroad, but what ended up happening surprised me. Read on to discover three lessons I learned from my working vacation in Barcelona. Leading up to my trip, I worked out a plan with my client about how best to spend my time between work and vacation. Since there was no hard deadline for completion of the project, we decided that it would be best for everyone if I worked only a few days during the first week of my vacation and enjoyed the three remaining weeks without having to worry about getting work done. I also consulted Chris’ excellent post on working vacations and talked with Highgroovers who had tried them. At home, our trip preparations went smoothly. We’d booked a direct flight and reserved an apartment with WiFi. When my wife and I took off, I felt confident that I’d be able to be super productive as soon as we touched down. However, the realities of an international working vacation proved to be much different. We arrived in Barcelona safely, but our luggage didn’t make the final boarding call and was still in Atlanta (one of the perks of traveling on buddy passes). Hours were spent futilely waiting for luggage to turn up on the baggage claim belt, filing a claim for the lost luggage, and traveling back to the airport to retrieve our luggage the next day. Good thing we had packed extra clothes in our carry-on luggage, and buying toiletries was trivial. Although I had an excellent apartment to work from, WiFi was unavailable for the first few days of my stay, despite previous assurances. Hunting for WiFi was not only difficult and frustrating, but it also turned out to be unproductive. I had to juggle between using the impractically slloowww Barcelona city-wide wifi service or trekking over to a friend’s apartment to use their Internet. Both options were less than ideal. Once WiFi became available at my apartment, I was able to get a lot of work done at my leisure while enjoying the cool sea breeze. Lesson learned: Prepare to be surprised by the unexpected. Also, finding a cool, comfortable and quiet place to work—one with a solid Internet connection—is crucial to the success of your international working vacation. While we work hard at Highgroove, we also understand that there are adventures to be had, especially in a city rich with attractions like Barcelona. 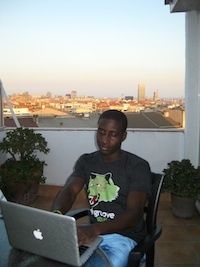 I found that plugging away from late morning to late afternoon, Barcelona time, worked very well for me. I was able to work without interruption for the first half of the day, and could interact with my client and other Highgroovers during the second half. Furthermore, I could work without distractions, since my wife ventured out with our Barcelonian friend during my work hours. Lesson learned: Work diligently and effectively for a set period of time, so that you don’t miss out on the amazing experiences that your vacation spot has to offer. 3. Enjoy your vacation! | ¡Disfruta tus vacaciones! If you are anything like us, we really really enjoy our work. So much so that we had to make vacations mandatory. Read between the lines, and you’ll see that we mean that enjoying your vacation is required. As a result, the decision was made that I would work only the first three days of my vacation. I’ll be spending the rest of the time focused on exploring Spain, France, Italy and Greece by car, train and plane. Lesson learned: Don’t work if you don’t have to! Despite all of my preparations, effective time management and commitment to enjoy my vacation, I found my first attempt at an international working vacation to be a bit trickier than I expected. I believe that an international working vacation can be mastered with enough time and practice. However, it’s not something that I would recommend unless you plan to plant yourself in one location for an extended period of time. Have you worked internationally? Where did you go, and what lessons have you learned from your experience?